Weekend Box Office: "Jack Ryan: Shadow Recruit" – Villains are Christian Russian Terrorists in Dearbornistan – HUH??? Allow me to state the obvious: Hollywood is no fan of Christianity...although they have shown an exception or two in order to turn a buck. Now they are complicit in keeping Muslim's "pure", and simply make Christians, the religion not too likely to burn down houses of worship or cut your head off, the bad guys. Christians, though never close to perfect, have always been foundational to this nation, to the greatness of this nation. History will record that America was destroyed from within, one brick at a time. -W.E. In the new “Jack Ryan” movie, terrorists trying to set off a nuclear bomb in America are CHRISTIAN terrorists based in a church in Dearbornistan, Michigan. HUH??? Tom Clancy hated the Hollywood movies based on his books. He said, “Giving your book to Hollywood is like turning your daughter over to a pimp.” And so it goes with “Jack Ryan: Shadow Recruit,” in movie theaters today. The movie, however, is not based on any particular Clancy book, but on the “spirit” of Jack Ryan, the main character in many of Clancy’s thriller novels. But it’s the worst Jack Ryan movie by far–no, by a Grand Canyon-sized chasm. The other Jack Ryan movies were decent. This stank. It’s not news that Hollywood will do anything to avoid showing Muslims as terrorists. It did that with at least two of Clancy’s works. In his “The Sum of All Fears,” Islamic terrorists detonate a nuclear bomb in the US (at the Super Bowl) to drive the U.S. and the Soviet Union into war with each other. In the movie of the same name, under pressure from the HAMAS unindicted co-conspirator in terrorism, the Council on American Islamic Relations (CAIR), the Muslims were no longer. Instead, they were neo-Nazis. (Director Phil Alden Robinson wrote CAIR, “I hope you will be reassured that I have no intention of promoting negative images of Muslims or Arabs, and I wish you the best in your continuing efforts to combat discrimination.”) In “Act of Valor” (read my review), the terrorist attacking the United States with thousands of homicide bombers is not Muslim, but a Russian Jew. Clancy co-wrote a novel based on “Act of Valor’s” original script, and there was no “Jewish” terrorist, just one who is Russian and implicitly Muslim. 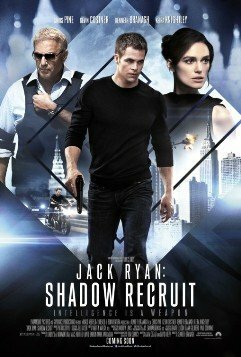 And in today’s “Jack Ryan: Shadow Recruit,” a terrorist cell based in the Muslim capital of America, Dearbornistan, Michigan, is not an Islamic terrorist cell in a mosque, but a Russian terrorist cell based in an Eastern Orthodox church, which aims to detonate a nuclear bomb in America. And the key villain in the movie is a Russian Christian billionaire (we’re shown scenes of the guy in church), played by Kenneth Branagh, who wants the bomb to affect the U.S. stock market and dollar. Are you kidding me–a Russian Eastern Orthodox terrorist cell in Dearbornistan, the city which is majority Muslim, has a Muslim, Hezbollah-supporting City Council President, and Arabs as a majority of its City Council? That’s how far Hollywood is willing to go to avoid portraying terrorists as they usually are in the United States of America: MUSLIMS. There is as much chance of a Russian Eastern Orthodox terrorist cell emerging out of Dearbornistan as there is in Beirut, Riyadh, Tehran, Mogadishu, Minneapolistan, or Cairo. The Christian-Russians-as-America’s-terrorist-enemies narrative is beyond tiresome. How many Christian Russians have blown up planes, buildings, and other installations in America? Answer: none. And, aside from the stupidity of the Russian Christian terrorist plot line, the movie is just awful. It gave me a headache. The movie was slow, tiresome, and boring, and made up for that by playing loud “the villain is gonna get ya” music for virtually the entire movie. The movie was also disjointed, confusing, and involved almost no suspense, but for two brief scenes. It was just stupid. This movie is supposed to be a “prequel” that explains the early years of Jack Ryan, but is really just a reboot, since Ryan’s “early years” take place after his later ones. Chris Pine is fine as Ryan. In fact, he’s pretty good (though he’s no Harrison Ford), but has a terrible script to work with. who was his physical therapist (Keira Knightley–whose weird American accent makes her sound like she’s speaking through permanently gnashed teeth). She is a doctor and doesn’t know he’s a CIA agent. Soon, Ryan is in Russia to investigate the Russian billionaire who is financing terrorism and plays a cat and mouse game to avoid being killed and to get secret information of where the money is going. Miraculously and with no evidence pointing to it, he suddenly uncovers a terrorist plot against America involving the ridiculous Russian Eastern Orthodox terrorist cell based in Dearbornistan. Believe me, I’m making this sound much more interesting than it is. It ain’t. This movie is a confusing mess of a bore. Skip it, and you’ll have missed nothing, other than the subliminal sounds of Tom Clancy turning over in his grave. Yet another of his daughters has been turned over to the Hollywood pimps.